This is BIG guys. You’re gonna wanna read the WHOLE SHABANG!! Let me give you a glimpse into my world right now. My Poshmark notifications are going off non-stop. People bundling into the wee hours of the morning. Mountains of packages piled high. This all in a span of just a few days! Overall in total just as of right now, I’ve made somewhere over $2000, moved 114 items, 68 orders and had over 100+ offers submitted (and counting!). IN A FEW DAYS!!!!! I KNOW RIGHT?!?? This is my biggest sales record so far, last time it was 47 items in 24 hours. I had a sale! Just like everyone else! But this time, it wasn’t just any kiiiiind of sale. 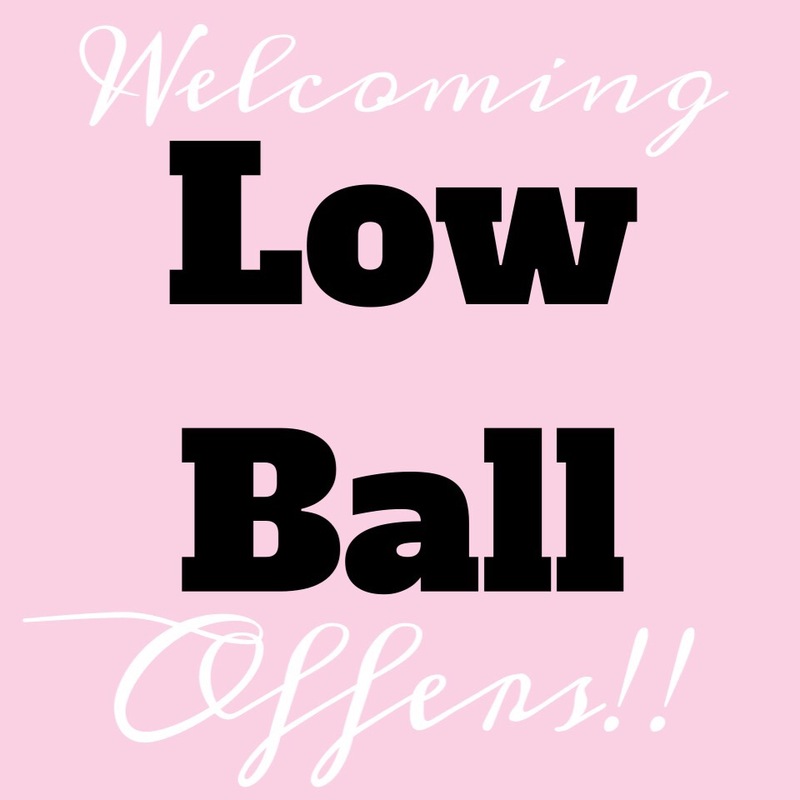 I had a LOWBALL SALE. So you can say I’m LOW BALLLLINNNNN’!!!!! I decided to flip the script: People hate lowballers. I decided that I was going to welcome them into my closet and have them shop. I came to the realization that everyone is a lowballer. You, me, and the entire world. No one WANTS to be a lowballer, but people do want to get stuff for free or even for less than the posted price. I just made it ok for them to do so. This all started when my husband and I started out plans for moving and the moving estimate was somewhere in the $9000 range 😱. The biggest bulk of the boxes would be from my inventory, so I needed to downsize and downsize quick! But I’m not into losing my money! Oh don’t worry honey. I did some serious prepping before I posted up any such ad. My husband would kill me if I didn’t think this through. So naturally I started working on my Poshmark Inventory Spreadsheet and looked up the prices of items and my clients items. And made sure that EVERY SINGLE SALE didn’t go in the red. I made a promise that I would NOT go under on any of these items. That includes my time/gas driving out and buying the item. Storage, shipping materials, and my time and effort LISTING the dang thing! All that included with the actual cost of the item. So with all that calculated into each of my 500 items I was ready to go. 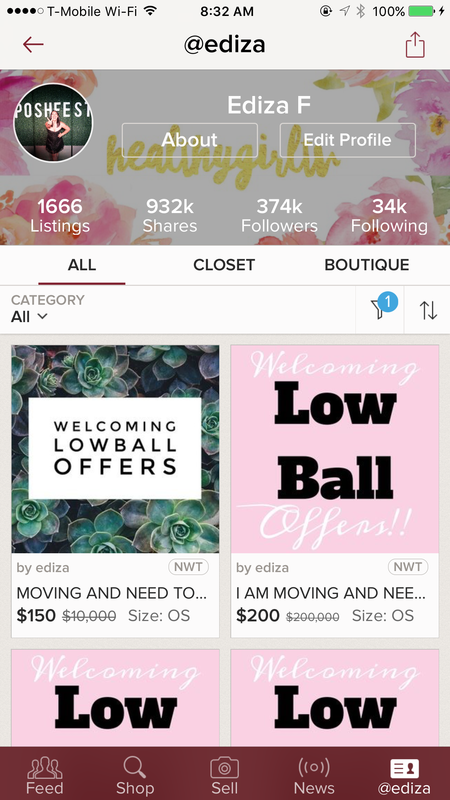 Also something to keep in mind, Poshmark doesn’t allow someone to lowball you to $0. It’s just not possible. A buyer MUST submit an offer 20% or higher than your listed price. Before anyone makes the comment I am going to clarify: if the listing price is $100 the buyer can’t offer you lower than $20. So price accordingly 😉. I started out with like 1-2 ads on my page then grew to about 9-10. It was MADNESS!! I couldn’t make dinner, my husband and I we were going CRAZY, just pulling items and printing labels. 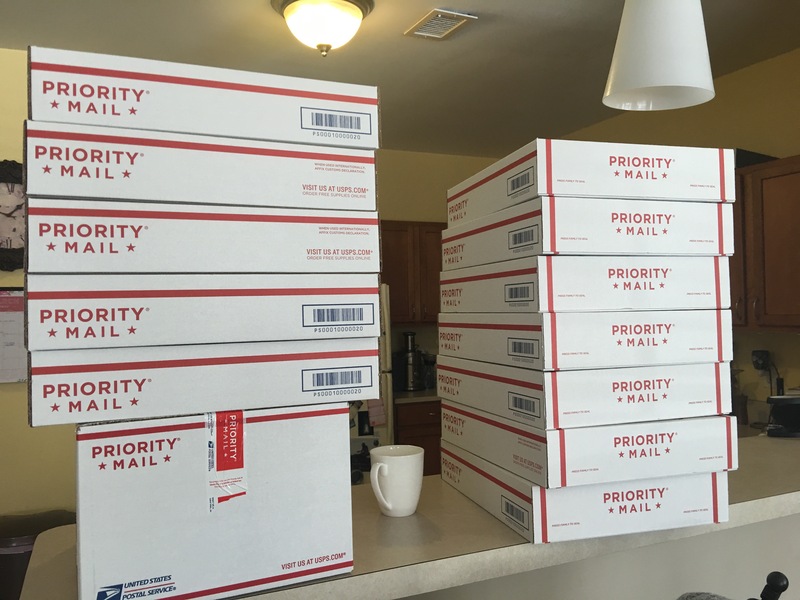 We were going mad trying to get 30+ packages out on a Sunday before our flights! Thankfully Meijer takes packages on Sundays, HOORAY! I also put notes in the ad listings that for certain brands or items of clients would be countered for the sake of satisfying their minimums. So I countered an F-ton. I wasn’t about to go down like that!! Now this might not be the sale for you, if you’re a business owner and you already do well, then you keep doing you Boo Boo! Don’t mind me, I need to move inventory like NOW so until my moving date, I’ll have my sale up and going! I know there will be a million questions on this, I will happily answer them down below in the comments box. Also please put your closet name and your link for others to check out your closet!